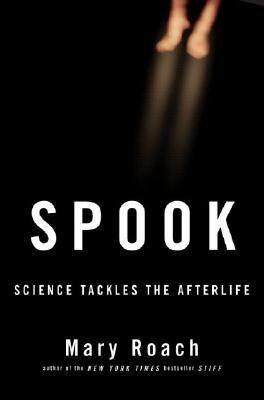 I’m gathering some scary stories for a fall display, and thought I’d add Spook–which is not a scary book at all, but rather an entertaining work of nonfiction that takes a look at life after death. Mary Roach, the author of Spook, wants to know if we can scientifically prove or disprove the existence of life after death. She wants to know if there really is a human soul. She begins her investigation (or at least her narrative about it) in India. Roach accompanies an investigator who is hoping to verify the reincarnation of a man, born into a child who lives not far from where the man had lived his life. This journey is pretty disappointing, and what she learns supports Roach’s initial feelings–she’s a skeptic. In fact, proving or disproving the existence of the human soul has frustrated great philosophers, theologians, and scientists all. So the reader shouldn’t expect great revelation here. But what makes the book a worthwhile read is learning about some of the crazy history–and present day shenanigans–of folks who claim to be in touch with the dead. As always, Roach has fun in her investigations. She goes to medium school (really just a weekend workshop) and tries to learn the craft along with a cohort of believers. Roach also turns to science, past and present. At one time, a serious surgeon studied whether the soul had left the body by weighing patients at death and seeing if there was a change. Today, there are a few serious scientific institutes that study the paranormal. They use computers, infrasound and electromagnetic waves to try to locate the souls among us. They investigate those out-of-body experiences that people have during surgery when their hearts stop. High school housekeeping: Spook roams all over the place, but in a good way. California teens will remember the Donner party from their youthful studies of California history, and will be engaged by the author’s efforts to reach the spirits of those departed cannibals. Mary Roach has written several books about her investigations into questions that have always puzzled her. She’s always funny while she’s informative. Her footnotes, which can really stray from the subject at hand, are sometimes the most fun of all. A book that goes over well in book talks is Stiff: The Curious Lives of Human Cadavers. It, too, is an interesting read for fall as our thoughts turn to the dead (and the undead). This entry was posted in Controversial Issue/Debate, Humor, Non-fiction and tagged Adult books for teens, book reviews, Common Core standards, death, death and dying, ghosts, human soul, humor, Mary Roach, mediums, nonfiction, science, soul, spirits, Spook, supernatural. Bookmark the permalink. I’m a big fan of Mary Roach, but had trouble getting into this one. I’ll try to pick it back up again soon I think.